A truly stunning piece of jewelry, this two stone "Only Us" ring is set in stunning sterling silver. Measuring 6mm with a total Karat weight of 0.13, this peridot and cubic zirconia ring is the perfect accessory to show your love and faith this holiday season and everyday in between. 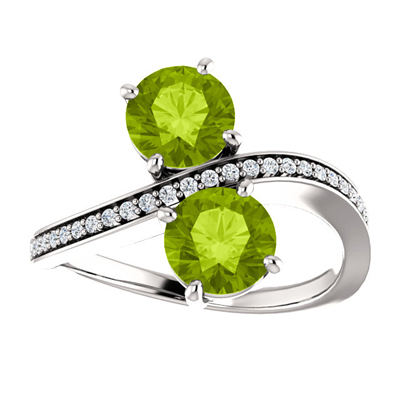 We guarantee our Peridot and CZ "Only Us" Two Stone Ring in Sterling Silver to be high quality, authentic jewelry, as described above.